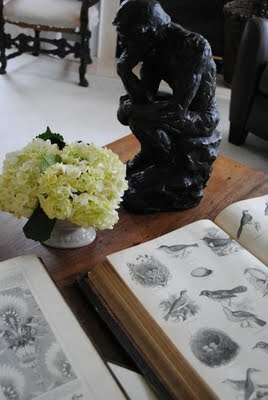 As promised, when I started this new blog, here are some photos of my home. Today I’m sharing my Family room. 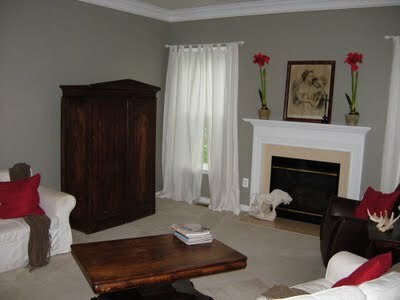 At one time this room was a bright fresh springy green, with pops of red. It was more of a cottage look. But I wanted something more sophisticated and neutral so I repainted this room, and the kitchen, with a nice taupe shade. The black and white floor leads into my kitchen. It’s kind of interesting in this photo, but I’m planning on switching it out for dark hardwood at some point. 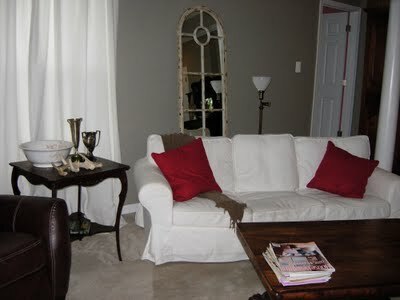 After painting the walls taupe, I purchased the white slip covered couches from Ikea. I removed all the old accessories and then I left it as a blank slate for awhile. I didn’t want it too cluttered, and I wanted to think about what should really go in the room. Then life got in the way and before I knew it, several months (maybe even a year? ugh!) had gone by and I still hadn’t really done anything with it. I showed some of the photos to two of my girlfriends, Amy who just happens to have been a stylist for Country Home Magazine, and Lisa who also has a great eye for design, and we hatched a plan to liven the place up a bit, and knock it all out in one day! Since we are all dealers at Old Lucketts Store, it was no problem to find great stuff. So the girls loaded up a van full of accessories, I made lunch, and we had a fun day playing with all the stuff in my house! Amy wanted to keep the wall behind the couch blank, the mirror that had been there really wasn’t large enough. I’ve since replaced it with a huge mirror, that works just right in the space. I’ll show you that another day! Here’s a peek at some of the books I use for The Graphics Fairy. The fresh flowers are part of Amy’s signature look, she’s all about the flowers! I think this clock is my favorite thing in the room, I love how well it works with my little collection of antique marble bird baths. Okay wait… this lamp might be my favorite thing too. Alright … they are both my favorite things! The old file cabinet and trophy collection, were mine and the table too, I just pulled them in from other rooms. This photo, and the one below, are the before shots. As you can see, not very exciting. 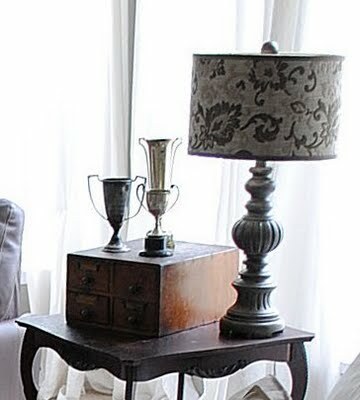 And the mirror and lamp, behind the couch were the wrong scale. The red Amaryllis were still up on my mantle, many months after Christmas! Yes, I do realize how sad that is, but at least I got the Christmas tree down! Anyway, I’m so pleased with how it turned it out, and it was such a fun day too! Thank you so much Amy & Lisa for all your help! Personally, love the uniqueness of the black and white floor between the living room and kitchen..everybody has hardwood, and it works so well with your colours.. I love your “after”, Karen! That must have been fun shopping for the new things to bring in. I love your black and white floor. I’m hoping to do one once we downsize, not sure where I would do it, but I love the look in a foyer hallway and kitchens. 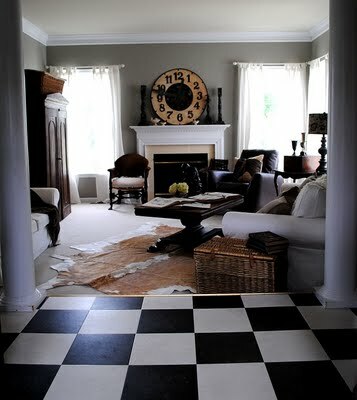 I love the Striking black and white floor…and those little bird baths are just simply adorable.. Thank you so much ladies! I like the floor in the pictures too, but if you saw it in real life you might change your mind. It’s vinyl, and it’s not holding up very well. It looks okay in this room, but in the kitchen it’s really getting worn. Four teenagers will do that to a floor! I love everything, I must say even the black and white floor!! Inspired! love everything about it!! thanks for sharing!! Love that rug its my purchase for our June Canton,Texas trip!Looks lovely Im saving your pics for a post after we move Total Inspiration!! I love it!I will certainly link back. You girls did a wonderful makeover! The before and after shows how important scale is to a room for drama. That clock is the centerpiece for sure. 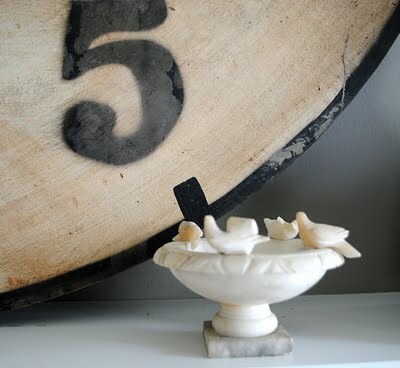 We had one of those marble birdbaths growing up and with five kids they were always pulling the birds out! Love the new look of your room. Love those awesome books too! Great to have talented girlfriends to lend a hand. Happy day! it looks lovely…i adore all the distinctive bits and pieces you’ve got tucked around the room…and the cowhide rug…thanks for sharing! I love this room! 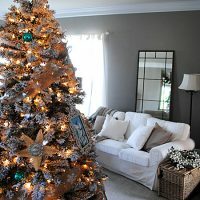 I just painted my living room last year but this grey has me contemplating a re-do! I already have the white sofas,wood furniture and antiques…so maybe it will be a Graphics Fairy inspired room when all is said and done! Lol 🙂 Thanks for sharing! I think your after pictures are lovely, sometimes it’s good to have a breathing space between putting things back as they were after re-decorating. We are in the middle of restoration and have used a slightly lighter colour than yours in our lounge using limewash and it also looks lovely. My rug is similar to yours so I am having a little preview as to what can be achieved! Oops…just re-read this post and the walls are taupe…not grey. Must be my monitor…but I have to say, grey still intrigues me! It looks stunning…but also comfy, peaceful and homey…a room you can really live in as well as enjoy looking at! The room is just beautiful. It’s warm, cozy and elegant at once, just gorgeous. 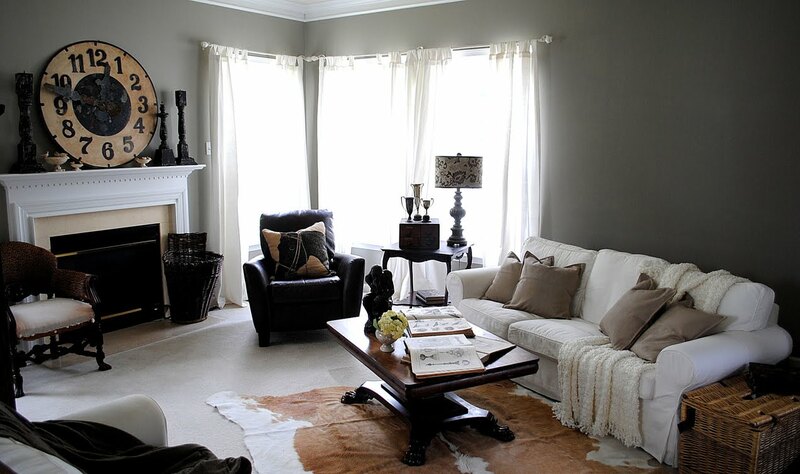 I have tried 5 different samples of grey/taupe in my new house. None of them work – they range from prison cell block to lavende. I love your paint color, do you remember the name/brand? It’s called Fawn Brindle by Sherwin Williams. I’m calling it a taupe, but it leans more in the direction of gray than tan, as far as taupes go! Beautiful, Karen! Thank you so much for sharing! Karen, thanks so much, you’re a lifesaver. P.S. My sister is gongyandsquish and she directed me to your fabulous site. Sisters? How fun! I think you both will really like this color. My friend Amy is something of a color genius and, although I picked it out, she was really taken with it. Oops make that Tiny Elf, not Tin!! the slipcovers & the rug. Glad to find your new blog. What a fun project. Wow! It’s stunning but I would expect nothing less from someone so creative as you are! WOW !!!! Right out of Homes Beautiful. Just stunning. My home tends to look more lived in LOL. Your room is so stylish and cool! I love the clock. 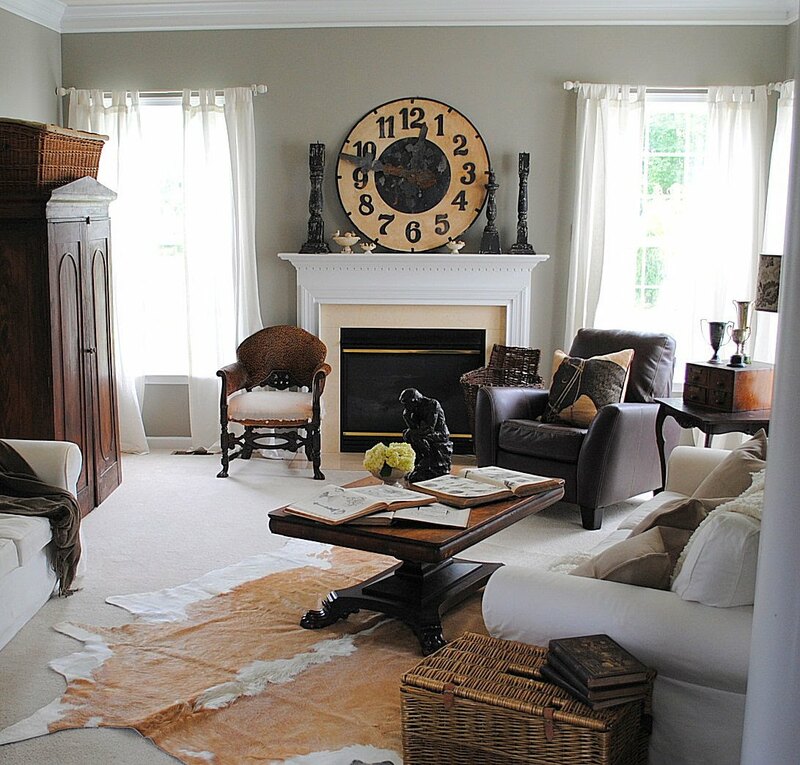 What an amazing focal point when you go into the room, The taupe is a great colour…there are so many taupes to choose from so it’s not an easy task. Wonderful space, it is clean and classy, but also very inviting. Very lovely..thanks for sharing, Karen. Love the simplicity! I like the way you and your friends dressed your living room. 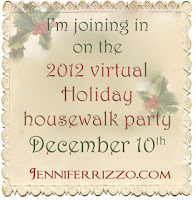 I am removing clutter and thinning out accessories from my spaces too. I LOVE the columns in the first picture. I love this room, it’s very elegant and yes, very sophisticated! I love black and white floors, we have black and white marble floors in the social part of the house. I love your bronce statue of the pensive man, it’s great, I like the pretty elements, like your clock, you have used to stage such pretty interiors! Just great! Have a terrific week. just beautiful Karen, and how lucky to have friends like that! It is a beautiful space now, you sure were a lucky girl to have such talented designer friends lending you a helping hand. Your house is gorgeous Karen! I love the darker feel, but the crisp airiness too! Great job ladies! Beautiful place you have! Thanks for sharing with us! Your house is fab I’d like to sit and have a tea and a chat w you on that big puffy sofa. Thanks for sharing! Your makeover is gorgeous…how wonderful to have two decorating friends. I too love your black and white floor but imagine it is hard to take care of. I LOVE YOUR BIG WOODEN CLOCK……..it stands guard over your home. Thank you for sharing your home with us. It is so inviting and cozy…and I love the light coming in through the corner windows…beautiful. I just became follower # 423. Stunning ! And I have my degree in interior design 🙂 But do you really have to lose the black and white floor ? I love it ! I think we all like seeing other people’s homes, thanks for sharing. Your story on how you got your living room put together is what most woman dream of. What a fun and wonderful day you all must have had. 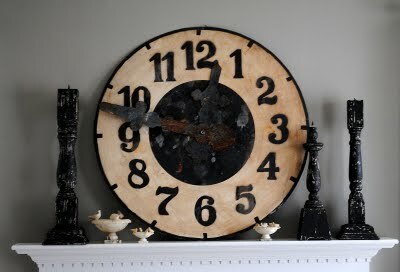 I am so taking with your beautiful mantel clock. Your hide rug is something I have wished for. I love it! Of course your books on your table I’d love to get my hands on. lol I really like the new wall color and how you angled your furniture. 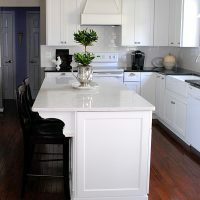 It would be such a shame to get of those black and white tiles -think very carefully, it would be a big mistake to get rid of them,love everything else.